Here are some common questions customers ask us about our cutting plasma table, along with the answers. Please give us a call so we can better answer your questions. The best way to see the machine and find out about it is to watch our demo video. Why should I order the demo video packet? Is this a kit? Are there any hidden costs? What does the cutting system include? What must I provide? What plasma cutter/computer should I use? Do I need PlasmaCAM Art Discs? Can I buy just the PlasmaCAM software? How can you sell such a high-performance system for such a low price? What kinds of materials can the machine cut? How big is the machine? Are other sizes available? Why does PlasmaCAM use servo motors instead of stepper motors? Why does PlasmaCAM use steel frame components instead of aluminum? What's so unique about this machine? Does PlasmaCAM have dealers or offer dealerships? Can I see a machine before I buy one? Can I talk to someone who has a machine? How much training do I need? How much do I have to know about computers? How much maintenance does the machine need? How well is it supported? What warranty and support does the machine include? What can I do with this machine? What kind of business can I start? The demo video packet includes an in-depth video demonstration of the machine and software, a detailed color brochure, full specifications, plasma cutter and computer requirements, and current pricing. A web site alone cannot give you nearly as good of a picture of what you can do with this system. If you're serious about buying a machine, the demo video packet is well worth getting. It really pays to have all the information before you make a big decision. The PlasmaCAM system is not a kit and doesn't require you to build, weld, grind-to-fit, paint, or assemble drive components. You don't have to fabricate any framework or supporting structure (like the cutting grate) to have a functioning machine. We provide a total system that has been manufactured, tested and crated for shipment. The whole design has been carefully engineered, tested and refined over the course of many years. Precision fabrication and quality control ensure that parts fit. There are no hidden costs. For one flat price you get a complete, state-of-the-art system that has everything you need for optimum performance. You simply provide the required computer and plasma cutter. Financing options are available; call for details. The PlasmaCAM cutting system includes the complete, tested machine plus the PlasmaCAM design and control software. The machine consists of a precise, rugged frame with an integral cutting grate, drive components with servo motors, a controller and electronics, and high-tech Digital Height Control™(Torch Height Control) . The PlasmaCAM software creates designs and directly controls the machine. Every part of the system has been specially designed to work together, giving you the best possible plasma cutting performance. You will need to provide a plasma cutter with a hand-held torch and a Windows-based personal computer (and a compressed air supply). Refer to the requirements provided in your demo video packet for details. The optional art discs, HVAC software, and custom tool holder (for routing or other specialized applications) are not included with the cutting system. Size the plasma cutter according to the material thickness you want to cut. You can mount virtually any hand-held plasma torch in the machine. However, it's best to use a cutter that incorporates contact start technology (as opposed to high frequency/high voltage start technology). Contact PlasmaCAM for compatibility information on specific plasma cutter models. Getting the right plasma cutter will save time and money in the long run. We highly recommend both New Hypertherm and New Thermal Dynamics(Cutmaster 1 series) brand plasma cutters for their overall performance. 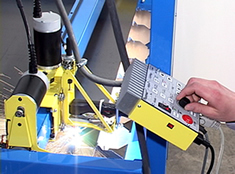 Refer to the requirements and recommendations given in the demo video packet before you buy a plasma cutter or computer. You don't need PlasmaCAM Art Discs to make products with this machine. Even complex ornamental iron is easy to make by scanning your own hand-drawn artwork or using artwork from another source, such as clip art. However, PlasmaCAM Art Discs make a great investment for individuals, businesses and schools who want to work with ornamental iron projects. You can use them to make all kinds of outstanding projects with very little effort. The enormous amount of creativity and time that PlasmaCAM artists put into each art piece is paid for by a pool of customers, meaning that each customer gets an excellent value. Plus, the number of Art Discs in circulation is relatively low. PlasmaCAM aggressively protects the Art Disc copyrights, diligently finding and prosecuting violators. This helps PlasmaCAM Art Discs retain their value and uniqueness. Because the PlasmaCAM software is so powerful, fast and easy to use, several companies currently use it to program their laser, water jet, and other X/Y cutting machines. In order to do this, your machine must be programmable (for example, magnetic and optical tracing machines are not). Also, you need some way to upload programs to your machine from a computer. Our software can create program files in DXF, G-Code or HPGL/2 format. If your machine uses some other unusual format, it probably has translation software to turn one of these standard file types into the format needed. Our technical support department can help you work out the details once you receive the software. If you've watched our demo video, you know that the PlasmaCAM control system is truly unique. Instead of making you generate and run machine programs, the PlasmaCAM software directly controls the machine and cuts shapes from on-screen drawings. Keep in mind that these capabilities are only available when our software is used with our machine. We can't make other machines work like this, since they only run off of programs. Our software can really help with the design process, but the control process will still be very cumbersome. Since the system integrator doesn't have control over the design process of the components, they typically aren't specialized for the application and don't usually work together efficiently. This makes such machines very cumbersome to use and hard to learn. In most cases the machine doesn't even include adequate software. By contrast, our complete system was designed solely by PlasmaCAM, solely for plasma cutting. The motors, controls and software were engineered from the ground up, just for this machine. This means that no middlemen are involved in the components. It also means that the system is specialized for plasma cutting, very efficient to use, and easy to learn. The second reason is economies of scale. The PlasmaCAM system is manufactured on a scale never seen before in this industry. The efficiency of our manufacturing process minimizes the unit cost and helps us maintain great pricing. Our vast customer base also means you are buying a well-tested and perfected machine that will be supported in the long-run. Plasma cutting was invented as the result of trying to develop a better welding process. Many improvements then led to making this technology what it is today. Plasma cutters provide the best combination of accuracy, speed, and affordability for producing a variety of flat metal shapes. They can cut much finer, faster, and more automatically than oxy-acetylene torches. Basic plasma cutters use electricity to superheat air into plasma (the 4th state of matter), which is then blown through the metal to be cut. Plasma cutters require a compressed air supply and AC power to operate. Next, compressed air starts moving the electrode back and flows out the nozzle. A fixed gap is established between the electrode and the nozzle. (The power supply increases voltage in order to maintain a constant current through the joint.) Electrons arc though the gap, turning the air into plasma. Finally, the regulated DC current is switched so that it no longer flows to the nozzle but instead flows from the electrode to the work piece. Current and airflow continue until cutting is halted. The nozzle and electrode require periodic replacement. For this reason, they are called “consumables.” Plasma cutters are only useful for cutting metal. Non-conductive materials like wood and plastic prevent the plasma cutter from doing step 5 above. The above steps describe the operation of a contact start plasma torch. Some older plasma torch designs use high voltage sparks to bridge the gap between a fixed electrode and nozzle when starting the arc. These high frequency/high voltage start units are generally not recommended for use with a computerized machine, because they cause severe electromagnetic interference. Virtually any metal can be plasma cut including steel, stainless steel, aluminum, brass, copper, etc. Any thickness from 30 gauge through 1 inch can be cut, depending on the plasma cutter used. The material used can be as large as 4ft wide by 20ft long. Plastics and wood are not electrically conductive and cannot be plasma cut. However, you can use a rotary saw, router, or other tool if you want to cut these materials in the PlasmaCAM machine. The accuracy of the machine is better than that of the plasma cutter. When the machine is coupled with a plasma torch, part accuracies as high as ±0.005 inch can be achieved, depending on material and setup conditions. Cutting speed can range from 0.1 to 1000 inches per minute. The machine and software will cut pieces up to 4ft by 20ft. The cutting table itself is over 5ft by 5ft, with a cutting area of 4ft by 4ft. After cutting the first 4ft area the table pauses, the sheet is indexed, and cutting is resumed until the entire shape is cut. A larger machine of the same quality would be more expensive and complex. Not only would many larger, additional parts be required, indirect costs would be higher too. The cost of shipping, installation, operation and maintenance would all increase. We find that most customers prefer an affordable, trouble-free machine to a large machine. Material handling would be more difficult with a larger machine. Larger material is heavier and more unwieldy, making it more difficult to load and unload. Larger machine tools are less accurate (consider lathes, for example). As size increases, accuracy decreases because tolerances are harder to hold on larger parts. Alignment of parts in a large assembly is also more difficult and complex, requiring extensive field work. Because it's the optimum size, the Model DHC2™ achieves outstanding accuracy. A larger machine could have lower performance (if built wider and heavier). Heavier moving parts cannot move as fast and would result in lower productivity and poor quality when cutting lighter materials. By contrast, the Model DHC2™ keeps moving parts free of extra weight. Most plasma cut parts are less than 4ft in size and can be cut on the Model DHC2™ without indexing. Though material is usually bought in 8ft and 10ft lengths, sheets are easier to move through a smaller machine than a larger machine. Economies of scale make the Model DHC2™ very affordable, because we build so many of them. We're also able to focus on making this one system the best that it can be. Many of our customers have bought machines with the intention of making them bigger (by purchasing another set of drive rails and fabricating a larger frame and cutting grate). Yet very few have actually followed through and done it. Why? Customer feedback suggests that once our customers get their machines and start using them, the perceived need for a bigger machine usually evaporates. It's true that this machine could be made a lot cheaper if we used stepper motors and drives instead of high-tech servo motor systems. But when it comes to something this critical, quality cannot be compromised. Experienced machine tool users know that servo motors are vastly superior to stepper motors, because newer, high-performance machines (like CNC mills) use servo motors, whereas older, more troublesome machines used stepper motors. Yet the real reason for the performance difference requires some explanation. PlasmaCAM's servo motors use optically-encoded feedback, so the controlling software always knows the true position of the machine. A simple stepper motor controller must “trust” that the motor has moved exactly as requested each time a step current is made. Without feedback, the controller cannot identify and correct whenever the motor misses a few steps (like during jolts, vibrations, hang-ups, etc). Since a single shape may require millions of steps to trace, errors in position will continue to accumulate unbeknownst to the controller, until the machine is finally re-zeroed against a physical stop. Hence, errors in stepper position are both unpredictable and unreported. To solve this problem, optical encoders can be coupled to stepper motors so the controller can determine the true position and make corrections when needed. However, the added cost and complexity prevents the system from being a low-budget alternative to servo systems. The more common solution involves overrating the motors (using larger, higher-geared motors that are under utilized) to reduce the probability of slipping. This extra rotating inertia (typically much greater than the mass of the moving parts) brings undesirable side effects: diminished acceleration and speed. For plasma cutting, the machine's ability to cut intricate shapes (which require abrupt changes in direction during high-speed cutting) would be greatly limited. Powerful, lightweight motors are a must, because their torque is needed for speeding up and slowing down all the moving mass – including the spinning motor armatures. (To picture the importance of this, imagine pushing a 100 lb cart at a walking pace and trying to make a sharp 90 degree turn without overshooting at all.) That's why the Model DHC2™ fully utilizes the 300 oz-in capability of its servo motors, providing over 1.5 G of acceleration. (An object traveling at 100 inches per minute can totally reverse direction in only 0.002 inch at this acceleration.) See the photos of intricate sample parts throughout this web site and watch the demo video to see what this machine can do for you. The Model DHC2 does provide some cost savings by utilizing a stepper motor for the Z axis only. This motor can miss steps and is much slower and weaker than the X/Y axes motors. However, it's not nearly as critical because the motor only has to control the height of the torch. Accuracy is not affected, less speed is required, and the position is automatically reset by the controller between each cut. PlasmaCAM machines are made from laser-cut, cold-rolled steel components. Steel is much more durable and has a higher melting point than aluminum. Our precision manufacturing process allows higher accuracy as well. Comparing tolerances, our guide rails are about 3 times straighter than standard aluminum extrusions. Another benefit of an all-steel frame is that temperature distortion is avoided. If we used aluminum frame pieces, we would still have to bolt steel parts to them (like gear racks and guides). This would create bi-metal strips that actually curve under temperature changes. Also, the whole table would grow and shrink under the material. But since all steel is used, the machine remains accurate to the material. PlasmaCAM is the best-selling CNC plasma cutting machine in the world. As you will see from our demo video, there is no other system with similar capabilities. Because of the number of machines we manufacture, we are able to provide you with the best possible quality and service for the price. The PlasmaCAM software/control system is the most unique part of the system. With this visual, interactive technology PlasmaCAM has brought a whole new level of fabrication capabilities to everyday metalworkers who would have otherwise struggled with traditional, complex CNC programming. Our quality control and commitment to customer support are unprecedented. Examples include software upgrades, a 3-year limited warranty and technical support, and readily available replacement parts. PlasmaCAM is continually working on new technology to better assist our customers. We also develop new art packages on a regular basis to help our customers with metal art businesses make more money. Our designs are all protected by copyrights, patents and trademarks which we rigorously defend. We don't sell through dealers in North America because we sell the machine directly. Dealers would need added markup, making the price you pay much higher. Also, dealers probably couldn't support the machine as well as we can. Our staff specializes in this machine and is readily available to help you if you need help. Even if your local dealer bought a machine and kept it on display, you'd find that our demo video gives you a much more thorough demonstration of the machine than you could get there. You can also schedule a visit to our Colorado facility if you want to see a machine in person. If you're a dealer checking into this product, there are other incentives for promoting it to your customers – without getting involved in the order processing and support side. There are many opportunities to sell plasma cutters and consumables. We often sell through dealers outside of North America, particularly where language barriers exist. In such places, dealers are uniquely positioned to provide better demonstrations, training, support, and product availability. Please contact us for help if you are interested in buying a machine or becoming a dealer overseas. In order to keep the cost of our system low, we don't sell through dealers. Therefore you avoid having to pay more for the machine, plus you get direct access to the highest quality support. We avoid costly local showrooms and demonstrations by instead providing an excellent demonstration video. The video actually demonstrates the machine more thoroughly than a live demonstration could. We also try to minimize the interruptions to our customers, since they have their own shops to run and appreciate this consideration as you probably would. So watch our video first; also read our survey results and testimonials. You can even order a sample part if you like. Once you have taken these steps, call us to discuss any further accommodations that you feel you need. The PlasmaCAM system is very easy to learn and use. There's no need for expensive training seminars or long startup times. Our video manual provides fast and effective training. Live-action illustrations and tutorials guide you through setup and operation of the machine. Several example projects also help you learn the software. Depending on your prior experience with computers, CAD and CNC, you should be up and running in a few hours to a few days. If you lack basic computer skills and are not familiar with Microsoft Windows, we recommend that you buy a book, learn from a friend, or take a computer class for beginners. Because the PlasmaCAM system is so well designed, maintenance and repair requirements are much lower than you might expect. We provide excellent support for the machine in case you need help, and replacement parts are available. Please see the purchase info in your demo video packet for more details on support and service. The machine is covered by a 3-year limited warranty and free technical support. PlasmaCAM machines are often used as a main part of an ornamental iron, sign, or landscaping business. You can make products like railings, gates, sculptures, benches, tables, furniture, truck racks, weather vanes, wind chimes, security doors, fireplace screens, company signs, ranch entries, address & welcome signs, key & coat racks, hardware, garden ornaments, candle holders, lamps, picture frames, mirrors, clocks, business card & napkin holders, decorative kitchen items, and so on. Our customers do both high-end custom work and low-cost, large-volume manufacturing. PlasmaCAM machines are also used to fabricate geometric, mechanical parts for manufactured products. Your shop or plant may be currently making flat parts that could be made much more quickly and economically with PlasmaCAM. Not only can plasma cutting replace many shearing, drilling, and sawing operations while reducing scrap, but plasma cutting generally outperforms laser and water jet in terms of cutting speed. Some of our customers run as many as 4 machines at once, on a nearly continuous production schedule! A related use of PlasmaCAM machines is low-cost, rapid prototype building for research & development. The ease with which a new product can be drawn in CAD and then cut on the machine is revolutionizing the design process in some companies. Another related use is by repair shops, which use PlasmaCAM machines to make various parts that are needed to repair a large piece of equipment, for example. You can quickly measure a part that needs to be replaced, draw it in our software, and cut a brand new replacement. Several PlasmaCAM machines are used in heating & air conditioning businesses to make custom HVAC fittings. Often these same machines are used to build other types of projects on the side (like metal art). A large number of high schools, colleges, and tech schools use PlasmaCAM machines in their shop classes. Because PlasmaCAM is considerably easier to teach than conventional CNC, instructors are better able to equip their students with cutting-edge skills they can use in the real world. A significant portion of current PlasmaCAM owners originally used the machine in school or business. If you don't have a PlasmaCAM system, you may be making parts the hard way. Get our demonstration video today and see the difference!